After my bout with nothing but floral dresses in the late 90s, I shied away from floral for quite sometime. I’ve been easing my way back into it and I can honestly say I’ve fallen head over heels in love with this floral dress from eShakti. It’s their Swiss dot floral print cotton dress and it makes me feel very feminine. The dress has little textured dots and gorgeous blossoms. It features a side zipper making it easy to slip on over your head. As soon as I slipped it on, I knew I had chosen the dress for me. Between the lining in a cotton voile, the pleated full skirt and the optional side sash – I know I’ll be getting a lot of use out of this dress over the summer. Whether it’s for a date with my husband, a casual garden party or an outdoor wedding, this dress just works. 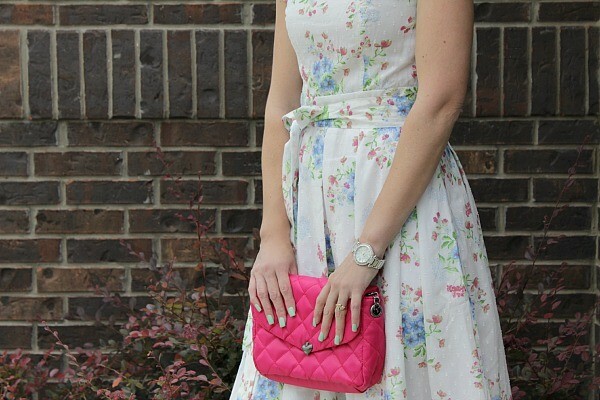 I paired the dress with brown wedge sandals and a pink clutch, to pull out the pink blossoms in the dress. Some other options are colored heels or white heels. A white clutch would also look very classy. So many options! If you’re not familiar with eShakti, let me tell you a little about their online store. They are the only online women’s fashion apparel company offering sizes 0-36W and custom clothing. You customize to your height, size and style. How great is that? You can keep up with them on Facebook, Twitter & Pinterest. I hope you’ll take a peek at eShakti’s selections! Disclosure: Mom Fabulous was sent a sample to facilitate this feature. No other compensation was received. Some of the links in this post are affiliate links. When you click on them and order something, I will receive a small commission.